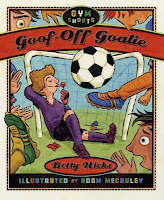 Goof-Off Goalie is the second title in the Gym Shorts series by Betty Hicks. After getting to know Henry in Basketball Bats, Goose is now the featured friend followed by readers. Goose fears he may be a wizard. On his tenth birthday he closed his eyes, made his wish, and extinguished ten of ten candles. One week later Alex Winkler vanished. Just like Goose wished. OK, he didn’t actually vanish, but Alex and his family did move to Vermont. Vanish/Vermont. Either way, the soccer team’s starting goalie now lives out of state. It’s the perfect opportunity for Goose. “Look at me. I’m tall. My arms are long. I can fill up more goal space than anybody.” All of this might be true, but as Henry says, Goose is a goof-off. His tryout doesn’t go well with the coach. GOALIE = DIVE, that’s what Goose thinks. Coach points out there are other, better ways to keep the ball from the back of the net. Henry decides to help his friend out. He develops a practice schedule. Every evening, rain or shine, it’s goalie practice. It works great! Goose’s skills improve, but unfortunately, Henry’s grades start to drop. Henry, Goose’s personal goalkeeper coach, receives a temporary parental suspension from athletics. That’s when Rita, Rocky, and Jazz come to the rescue. They take over Henry’s practice plan, and Goose’s improvement continues. Goose finally gets the chance he’s been wishing for. He also faces a difficult choice. Henry needs help, but if Goose does what he can for Henry, he may lose his golden goalie opportunity. What should a friend do? Here’s the best part of the Gym Shorts series. Goose, Henry, Rita, Rocky, and Jazz are true friends. They do whatever they can, whenever they can, for one another. Despite the difficulty of Goose’s choice, the correct choice is made. In the end readers will enjoy the fast-paced game action featuring Goose’s – and Henry’s – big day.